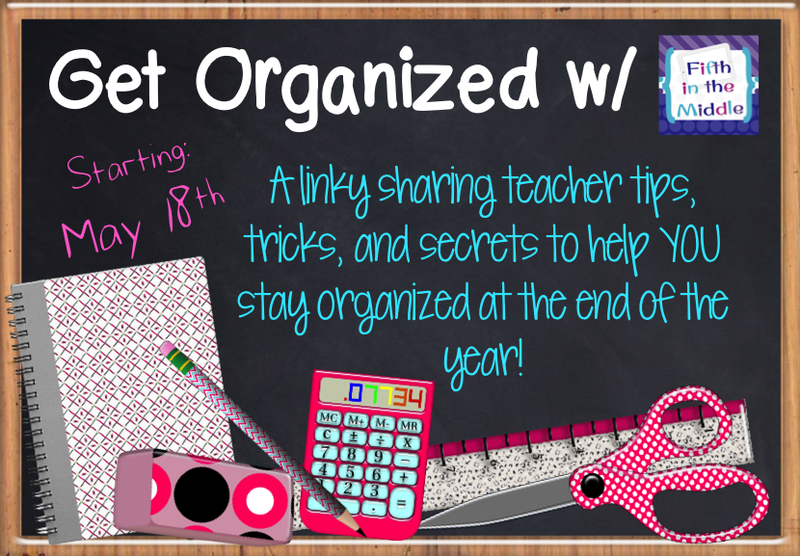 My BBB Diane is hosting a linky party that will help us stay organized at the end of the year! And, any tip to help us at the end of the year is a good one!!! The end of the year evokes so many emotions, but the one we feel the most as teachers is stress with all of the "last minute" things that need to be done. It seems like everyday we have some kind of paperwork due, parties, celebrations, field trips, awards, field day, meetings, etc., along with our normal daily routines. Well, when those last couple of days come around sometimes we just rush to throw everything in a box or in a file cabinet just to get it done. I mean, other people do that right??!! Stop...take a breath...and a picture! Depending on your school, depends on how much you have to "pack" up your room for summer cleaning. If you have to take down your bulletin boards, but it's one that you use year to year and you like the spacing or order of the posters, then take a picture so you can refer back to it for easy set up. We have to unload our bookshelves so they can wax the floors, and it seems I can never get the books/materials to fit just right again after I unpack them. So...I take a picture so I can remember how I liked it organized. I have several bulletin board signs and letters that take time to sort through, so for my reoccurring bulletin boards I store them in a binder for easy access. My welcome back bulletin board and Happy New Year Banner are temporary bulletin boards, but I use them each year, so I store them in a page protector and label the page. If you haven't taken down your bulletin boards, room décor, or room arrangement and you're happy with it, take a picture so you can reassemble your room quickly at the beginning of the year. **These pictures might also inspire you over summer to find other décor to coordinate with your room or to change some things you don't like. Either way, I hope these tips help you during the end of year craziness! Thanks for linking up! I love binders, so that storage idea is right up my alley! I am a first year teacher and I really appreciate the tips! I am definitely going to put my letters for my boards next year in a binder! I am so excited that I won! These bracelets are absolutely amazing, and they will be a fantastic way to motivate my students. THANKS!!! I love the idea of taking pictures of how you like things so that way you remember what they were like later! Ahhhh...organization....my old nemesis has come back to see me again. But hark! I shall be ready this year!! Loved the picture idea. Will pass that one along to my teachers. Great ideas.